For many, going to the Baltic Sea every year in summer is a must. And it’s no wonder: from Flensburg to Usedom, the Baltic Sea is incredibly versatile. Hotels on the Baltic Sea are located in beautiful medieval Hanseatic cities like Lübeck or in small villages very close to the beach. Visitors are drawn to the steep chalk cliffs on Rügen and to elegant marinas like the one in Warnemünde. In between, there are miles of beaches, often natural, with fine sand and fashionable seaside resorts. Chalky cliffs, lagoons and sandy beaches that stretch as far as the eye can see: The many facets of the Baltic Sea are nestled on the German coast of Schleswig-Holstein and Mecklenburg-Vorpommern, making the Baltic Sea an ideal location for a relaxing holiday. High up in the north are many holiday resorts with great recreational opportunities for children, while the Mecklenburg coast boasts stretches of sandy beaches adorned with forests and cliffs. And in the midst of it all are old Hanseatic cities like Lübeck and Wismar. For many, the most beautiful aspects of the Baltic Sea are its long, natural beaches, coastal forests, the sea itself and small fishing villages. These gems can be found especially on the peninsula of Fischland-Darß-Zingst. From sophisticated Ahrenshoop with its picturesque landscape and artist colonies to Prerow with camping spots and a relaxed crowd, to the amber town of Ribnitz-Damgarten just around the corner. Artist life: Anyone who wanders along here will think that they have déjà vu - so often has the landscape of the peninsula been painted and photographed. With its impressive landscape, Ahrenshoop has always attracted artists, who also like to retreat in specially furnished artists’ houses, and then, to once again paint the seas on the unspoiled cliffs. Selling handicrafts is guaranteed. Cliffs & sandy beaches: Pristine forest areas and wild, fine sandy beaches characterize Darß, whereas quaint captain’s houses in several small settlements characterize Zingst in the east. The elegant Steigenberger Strandhotel Zingst with its large spa area is right on the sandy beach that stretches for miles. The beaches of the island are long and wide, boasting beautiful coastal forests. The beaches are also characterized by the people who visit them: the beach of Prerow, which is up to 100 meters wide, is mostly frequented by young people and campers, while the artistic, Ahrenshoop attracts a more sophisticated crowd. Amber Center: Amber glitters here and there across the Baltic Sea. The biggest uproar around the pretty stone happens in the amber city of Ribnitz-Damgarten where there are amber saunas and a German Amber Museum, international amber art competitions take place, and an amber queen is crowned. © Villa WellenRauschLong beaches with fine sand, one seaside resort follows the next, the weekend destination of many Hamburg residents. Many attractions for children, wide promenades, glamor shopping in Timmendorfer beach, tranquil fishing villages, old ports, from villages to glamorous and everything inbetween. Glamor beach & Luxury shopping: Timmendorfer Strand - elegant restaurants, luxury labels, designer boutiques, jewelery stores, Michelin-starred restaurants, the pedestrian zone is the place to see and be seen. 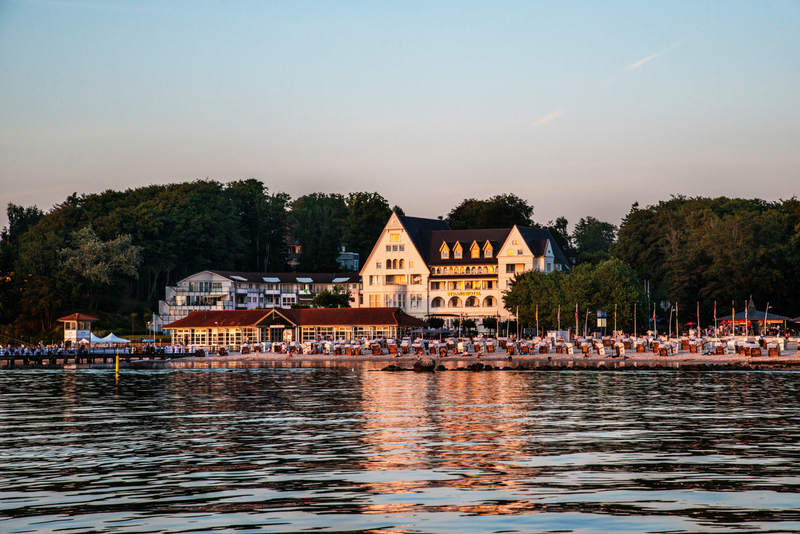 Niendorf, with its small harbor and Nordic comforts is right around the corner. 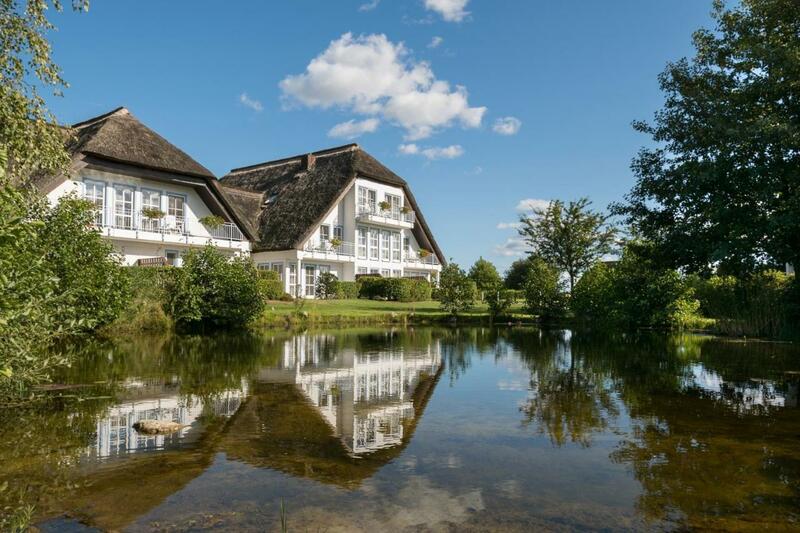 Seaside resorts for families: Scharbeutz, Haffkrug, Sierksdorf - in the bay, one classic, family seaside resort follows the next. Families are happy: the beaches are wide, well organized with roofed beach chairs and sections guarded by lifeguards. Ice cream shops and the like are within walking distance, the water is shallow and undisturbed. Sierksdorf offers more opportunities for water sports. It is slightly larger than the three seaside resorts next to Grömitz, with its sweeping promenade and long, wide beaches. Amusement parks: The Hansa Park in Sierksdorf will keep any family busy all day with rollercoasters, water rides and so on, and the Sealife Center in Timmendorf enchants all visitors with its underwater world. High overhead instead of in the water is what it’s all about at the bird park Niendorf, where the owls especially cause visitors to turn their heads. Chalk cliffs a la Caspar David Friedrich (Jasmund National Park), surfers frolick at Mönchgut, Rügen Rimini is near Binz and Granitz, and you’ll find 9-kilometer long sandy beach on the Schaabe. Rügen is a lively and versatile island, while Hiddensee’s narrow beaches, away from the hustle and bustle, are never crowded. And Stralsund, with a winding old town and historic buildings, is the gate to this lovely coastal paradise. Parties: In Granitz the party never stops - miles away in Granitz the beach stretches to Jasmund. In the Rimini of Rügen there is constant after-beach excitement with holiday flirting and loud fêtes. On the wide beaches of Binz, the celebrations are a little fancier. The 7km long, white beach makes it the “Ku’damm” of the North beach promenade. Upfront, young and cheerful – that is how visitors celebrate throughout the summer. 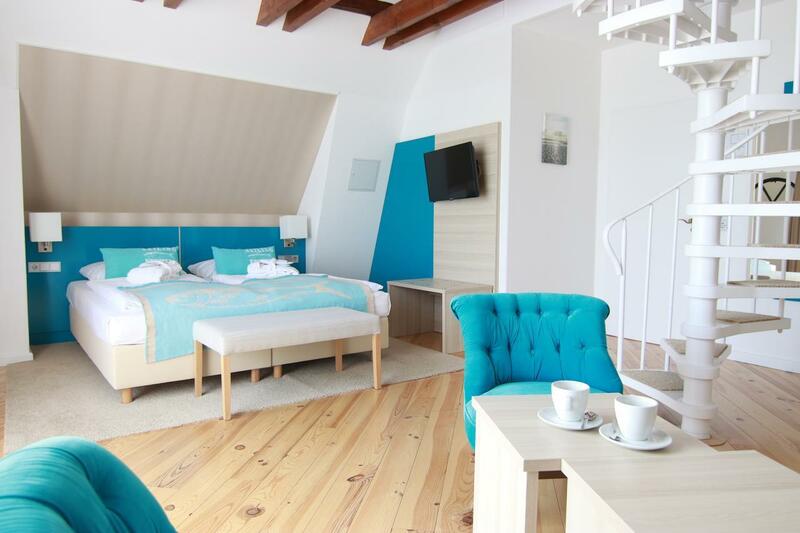 The Upstalsboom Hotel meerSinn is very close to the beach and the pier of Binz. Most beautiful beaches: The 9km long fine sandy beach of the Schaabe is white and wide, easily accessible and, if you look closely, you will find the perfect secluded spot here. The peninsula, Mönchgut, is ideal for surfing. The northern beach is sandy and stretches further than the stony south beach. In Hiddensee, the beaches are narrower, and, therefore, quieter. Winding Stralsund: The small, old Hanse town is in good condition, with many cultural attractions in the form of churches and museums. Winding streets with small cafés invite you to relax away from the hustle and bustle of the beach. © Weissenhaus Grand Village Resort & Spa am MeerWeissenhäuser beach boasts a water world, Hohwacht has steep coasts and it’s not just Heiligenhafen that has beautiful, wide, sandy beaches. On top of that, Hohwachter Bucht is not entirely in the hands of tourists. There are still old town centers here, too. Children’s leisure: The holiday park resort, Weissenhäuserstrand, with the largest waterpark in Germany and the newly built “Jungle land” is sure to make children’s eyes light up. But even the beaches have a lot to offer: when they are not overcrowded, they are like oversized sandboxes. Quiet coast: Wide beaches in Heiligenhafen, cliffs with a view in Hohwacht, here and there a pier. The beaches are a bit narrower, but quiet, lined with forests and meadows. Old town centers: Heiligenhafen has a charming marketplace, just before Fehmarn. Additionally, the other villages are not tourist stomping grounds, but flourishing holiday towns. Lütjenburg is also a very nice shopping destination, not far from the coast. The sunniest region in Germany, romantic sunsets, plenty of water sports such as surfing and kiting, cliffs in the east and charming beaches in the south. Camping, relaxing, cycling in the cosy atmosphere of a quiet village. Surfing & Kiting: Surfers and kiters have it all on Fehmarn. The Other Reede on the west side of the island is particularly suitable for beginners. There, the water is just 1,50m deep. On the north coast, professionals can test their skills on the surf, in the southwest on Burger Binnensee they race back and forth in the east wind. There is an abundance of surfing and kiting schools. Beaches: Almost 80km of coastline means there is something for everyone. The south beach near Burg has the only beach promenade. The fine sandy beach is wide and the sunset gigantic. It is rougher in the east, with cliffs and stony seabeds. The north coast of Puttgarden to the northwestern tip varies between 5 and 20m wide, surrounded by dikes and forests. On the western side, the beach is very narrow, whereas the southwest is quiet and sheltered. Camping: Fehmarn is a dream for campers - along the coast there are campsites everywhere, most of them boasting direct access to the sea. From sociable and quiet (for example, Strukkamphuk) to a wide range of offers like saunas, surfing and bouncing castles (eg Camp Fehmarn island). Boltenhagen, completely renewed and in full bloom, the child-friendly beaches in the bay with shallow water and gentle waves, cycling paradise island, Poel with the pretty fishing village of Timmendorf. Chic & Family-friendly: Boltenhagen has undergone an all-round renewal and has become a center of attraction for the region: as a modern seaside resort, Boltenhagen impresses, not only with its 290m long pier but also by its attention to detail. At the port of the modern seaside resort, the fish is sold directly from the boat. In addition, the 4km long beach with shallow water is ideal for children. Plain, Cycling & Fishing villages: The island of Poel is incredibly small - trees can only be found at the village, "Black Bush", otherwise the area is particularly flat and, therefore, perfect for cyclists. From Kirchdorf, it’s best to cycle in the direction of Neuhof, enjoy the views from the Kikel "mountain, " pass the harbor and lighthouse and through the nature reserve, until you reach Kirchdorf again. Then you can rest and relax on the beach in pretty Timmendorf. Surfing & Sailing: The beach at the seaside resort of Rerik has two faces: it is narrow below the steep coast, but wider in the Salzhaff Bay and overrun by surfers and sailors. The Bad Doberan, founded as a monastery, the elegant Heiligendamm, one of the most beautiful linden-lined streets in Germany, the endless promenade near Kühlungsborn and the Rostocker Heide of Graal-Müritz. Avenue Sightseeing: Whether by narrow-gauge railway "Molli" or by bike, on foot or by car: the tree-lined avenue between Heiligendamm and Bad Doberan is a must-see: tall, 200-year-old linden trees line the streets. Once a year, a horse race takes place here. Other unique paths lead to the Seeheilbad Graal-Müritz, the Rostocker Heide and the coastal forests. Villa flair & Elegant beaches: Art Nouveau, countless villas, a fantastic beach, endless promenade: Kühlungsborn holds a lot of charm. Numerous restaurants line the beach promenade. Bad Doberan and Heiligendamm are elegant and historic. The monastery of Bad Doberan is a particularly exquisite eye-catcher. Hiking: The 6,000 hectare area of the Rostock heath extends into Graal-Müritz and directly to the beach, creating a special spa climate in the Seeheilbad. Hikes and bike rides through the unspoiled heathland and forest landscape are especially enjoyable. Spa history: Prominence, nobility and luxury – these three adjectives describe the Heiligendammm perfectly. Earlier, the Tsar’s family and high nobility spent their holidays here. The first horse race track in Europe was inaugurated between Bad Doberan and Heiligendamm in 1823 and attracted even more stars of the time. Every year in August, the fastest horses come to race amidst great pomp and ceremony. Today, Heiligendamm is trying to revitalise its image as an exclusive seaside resort – starting with the Grand Hotel Heiligendamm. © Balmer See – Hotel•Golf•Spa Peaceful bodden and open Baltic Sea, surfing and sailing for all, modernized imperial baths, romantic amber baths, relax while cycling over the island past mills and sleepy villages. Sailing & Sailing schools: The versatile coast of Usedom invites you to sail: peaceful bodden to open sea. Numerous harbors and jetties with sailing schools make sailing possible for everyone. Imperial baths & Beach parties: Nowadays, it’s no longer only the nobility who get to bustle along the 8,5km promenade in the former "imperial baths" Bansin, Ahlbeck and Heringsdorf and in wonderful hotels and wide beaches. The beach resorts are very busy in the summer, and those who like beach parties just as much as beautiful architecture will be in their element here. Ahlbeck, the largest of the three seaside resorts, has the most to offer in terms of recreation. Heringsdorf is a little more elegant whereas Bansin is quieter and more distinguished. The party also never stops at the seaside resort, Ückeritz, particularly on the 60m wide beach with its steep bank. Zinnowitz is the most urban beach resort of Rügen, with many cultural and recreational activities, namely the Bernsteintherme and the Sportpark Barge. Idyllic & Secluded bays: While in the eastern part the party never stops, southeast Usedom is the complete opposite: Idyllic, quiet, lots of nature, secluded bays, large and small ponds, farm cats and bumpy roads. 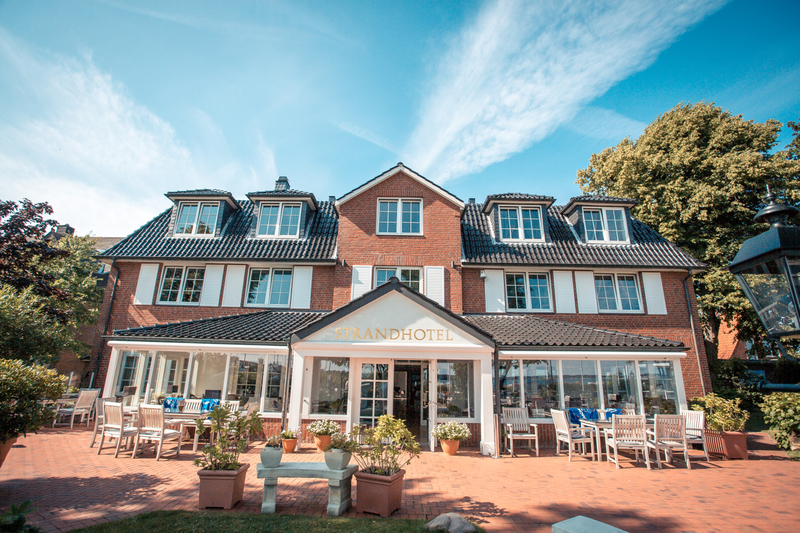 Time to cycle and relax, for example in the lovely Appartement Hotel Landhof Usedom in idyllic Stolpe. © Strandhotel GlücksburgThis is the closest you’ll get to Denmark without leaving the country; red hot dogs are a local specialty and both German and Danish are spoken. Rural and quiet, beautiful bike paths meander through the greenery to the Baltic Sea. Ideal for a quiet holiday, not far from charming Flensburg and always right at the beach. Cozy Flensburg: Rum metropolis with German-Danish character. The pedestrian zone, Rote Straße in the old town is particularly charming with small workshops, galleries and heaps of North German coziness. Another eye-catcher is the harbor. Green cycling paths: There are many cycling paths along the Flensburg Fjord, which take you straight to the flat countryside, through some forests, and to the Baltic Sea. If you do not want to get lost, follow the “Baltic Cycle Route” signs. Swimming beaches with a view: From the natural beach of Langballig you can see the Danish coast. A wide sandy beach can be found in the nature reserve, "Holnis Drei, " Glücksburg offers a well-kept spa beach with many restaurants and you can choose between a meadow and sandy beach by the sea in solitude. Forests & Museums: Walks along meandering streams through beech forests and across meadows. In addition, there are 5 museum islands in Langballig that transport you back to the past. Glücksburg, on the other hand, trumps with the moated castle Glücksburg and beaches that stretch for miles. Holstentor, old merchant houses, ancient churches and museums and a beautiful harbor. Medieval charm flows from alleyway to street, yet it remains young and hip and offers shopping à la Zara, etc especially in Breiten Strasse. Lübeck offers far more than just marzipan. And the sophisticated Travemünde near Lübeck boasts beautiful beaches. Church sightseeing: The 7 towers of the 5 major churches and the Welcome Holstentor are just the beginning - Lübeck has tons of churches and museums on offer. In and around Breite Straße makes for great shopping, whereas the sidewalks are a great place to buy artworks and handmade crafts. The view from the Petri church is breathtaking. Medieval flair & Buddenbrookhaus: Castle gate, crooked, red brick houses, small streets, like the Engelsgrube and the old harbor: Lübeck transports you to another time. Many old crafts in a historical setting and city criers contribute to that. St Anne’s Museum with the Memling Altar is an incredible attraction. Thanks to the various houses of the Nobel Prize laureates, Lübeck also leaps into the present: the Buddenbrookhaus is a memorial to Thomas Mann, whereas visitors will enjoy a trip to the Willy-Brandt-Haus and Günther-Grass-Haus, to see where the writer worked. Exclusive beach: Lübeck-Travemünde offers sailors and swimmers a beach paradise with urban flair: Casinos, architectural beauties, a 4km long, 20m high cliff (Brodtener shore), wide sandy beaches, the four-masted barque, "Passat" and a "green beach" (lawn) cater to the taste of every visitor. Vintage harbor flair: The beautiful harbor on the Trave made of indigenous wooden, historic sailing ships in front of the narrow brick buildings on the Untertrave, which transport you to another time. Whoever would like to sail, should get cozy with the captain or individual sailors. Brick Gothic and Swedish times, beautiful linden gardens, charming harbor, cozy sidewalk cafes, own city beach in Wendorf. In the old Hanseatic city of Wismar, the mood is contemplative and relaxing. Swedish charm: The small Hanseatic city invites you to relax and unwind. It is small, yet full of historical architecture and close to the sea. Directly at the marketplace is the “Alte Schwede” ("Old Swede"), one of the many buildings that date back to the Swedish period. The constant back and forth between Germany and Sweden continued until 1903. Even if the former southern part of Sweden is now clearly Mecklenburg, much can still be discovered about the Swedish period (armory, Schwedenköpfe in front of the Old Harbor, Schwedenstein). Café flair: This pretty town knows how to pamper its guests. Especially if you go to Krämerstraße, behind the town hall, where beautiful gabled houses and numerous cozy cafes line the small streets. Family-friendly city beach: A small yet fine sandy beach can be found in the district of Wendorf - the water is very shallow so you have to go a bit further out if you want to do some swimming. Perfect for kids. The nearby playground and the 350m long pier are the icing on the cake for families. The old university town is the largest city in Mecklenburg-Vorpommern. In summer, the HanseSail takes place here in Rostock. Kröpeliner Straße, an elegant shopping street is the perfect place to go shopping before heading to the district of Warnemünde directly on the beach of the Baltic Sea for a swim. Cozy pubs and cool clubs round off the student nightlife here. Shopping: Rostock’s shopping mile is Kröpeliner Straße - in the pedestrian zone, besides for H&M, Zara etc, the elegant shopping center, "Rostocker Hof" boasts exquisite fashion. Student Nightlife: The Kröpeliner Vorstadt attracts a young, student crowd with its individual bars and loud pubs, whereas the city center offers more sophisticated bars. The Kulturkombinat Bunker presents various cultural offerings for students and pulsates with concerts, films, exhibitions and readings. Regulars at the Bacio Lounge at the city harbor like to chill out on the roof terrace or party inside. Lively beach: Warnemünde is Rostock’s beach. What makes it so popular are its colorful fishing boats, atmosphere of a fishing and maritime town, a 7km long, fine sandy beach and colorful hustle and bustle on the promenade. From Warnemünde you have direct access to the nature reserve, Stoltera, with gorgeous coastal forests and high cliffs. © Strandhotel StrandeThe largest city in Schleswig-Holstein, concerts at the sailing regatta, "Kieler Woche, " large sailing port, beautiful maritime museum, shopping for all, the Baltic Sea bath, Laboe boasting a walk-in submarine, the Kiel Canal around the corner - Kiel is young and modern. Young shopping: In Holstenstraße the usual shopping centers such as H&M can be found, while Holtenaustraße has plenty of smaller shops and boutiques. The university city offers great shopping opportunities, especially for young people. Sightseeing on the coast: The most popular seaside resort near Kiel is Laboe, right on Kiel’s eastern shore. The fine sand still remains flat far out into the sea. There is a submarine here, too, that can be visited. If you love admiring large ships, you should keep an eye on the lock canal of the Kiel Canal from the viewing platform in Kiel-Wiek. Shipping: Kiel has a seafaring nature and a great love for the sea. The Maritime Museum boasts three museum ships, in the harbor are large yachts and sailors and in the last two weeks of June, the largest sailing event in the world takes place in the form of the Kieler Woche with many concerts and activities. Family holidays: The Baltic has a gentle side – mostly. Many beaches, like those in Wismarer and Hohwachter Bay, are wide and ease into the water and also the bodden waters of Usedom make it easy for children to stay in the water all day. At almost all seaside resorts there are lifeguards and recreational activities, such as pedal boating. Tourist tax: You have to pay city tax at most beach resorts in Schleswig-Holstein. If you are caught without paying the tax, you will pay a hefty fine. The tourist tax regulates all tourist activities including the cleaning of the beaches. Tourist crowds: In the summertime, tourists flock to the Baltic Sea in droves. It is worth it to try and find a quiet spot a few kilometers away from the usual beach spots and resorts. The farther away from the cities you are, the more undisturbed you will be.